At least, we console ourselves, the moonlight will make it easier to see the penguins. It is the night of a super moon - the last super moon for 2016. While we wait for the penguins to appear, our guide gives a short explanatory talk. 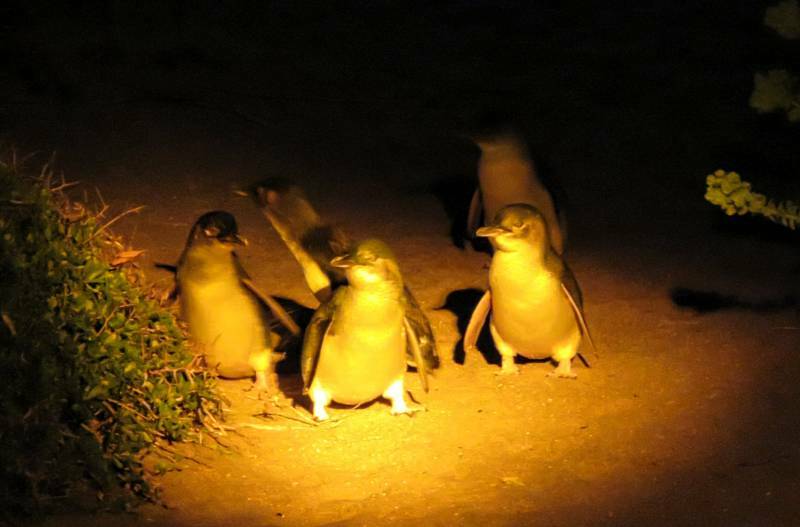 It turns out little penguins don't like full moons. The shadows cast by bright moonlight make them nervous. Tonight they won't hang around on the beach but instead seek the shelter of their burrows as quickly as they can. Before this information has time to sink in we see our first group of penguins about 50 metres away. There are about 12 of them on the beach at the edge of the water. Other groups must be in the surf plucking up the courage to dash ashore but in the fading light we can't see them until they reach land. Then we see another group, closer but still hard to see, huddled next to an outcrop of rocks. The only way to see the Low Head penguins is on a guided tour. Although you can wander through the reserve during the day, it is closed to the general public for several hours before and after sunset each night. There are about 60 people here tonight and we have been separated into groups of about 14 - each with their own guide. There are no lights on the beach but each guide has a couple of wide beam torches. Two of the groups are down on the beach right next to the penguins. Chicks standing outside their burrows in search of mum and dad. I am disappointed that David and I are in the only group not allowed on the beach. We are seated on rows of benches too far from the action to be able to see much at all. Our guide is explaining that the penguins have stopped by the edge of the water to preen themselves before continuing across the beach and through the sand dunes to their burrows. 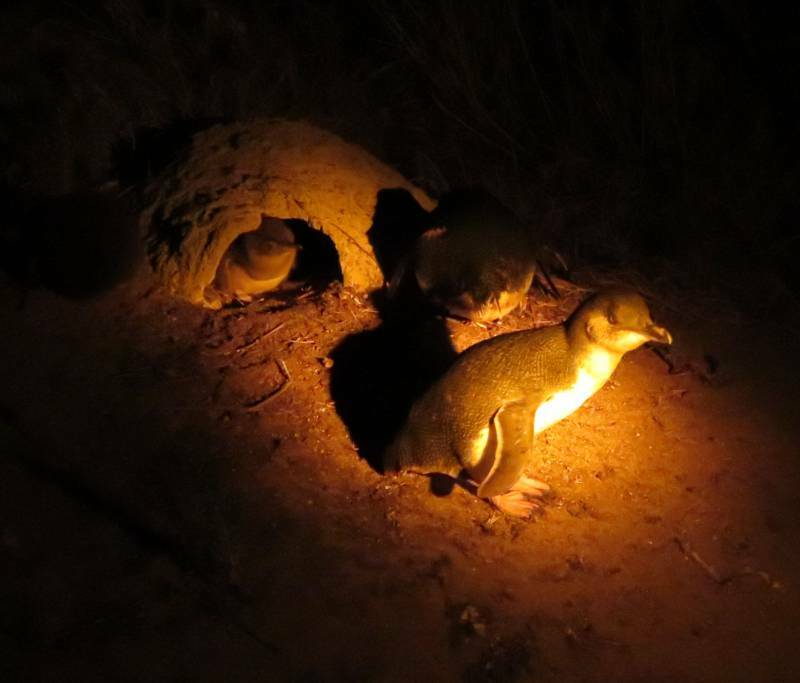 It is breeding season and the penguin chicks are waiting in the burrows for their parents to arrive home and feed them. I'm only half listening - mostly I am trying to peer through the gloom at the distant birds. As if our guide has read my mind, we are told to follow her into the sand dunes behind us. We stake out one of the routes the birds follow through the dunes, lining up on either side of the path like a guard of honour. It is not long before a small group comes waddling up and stops a couple of metres from us. They spend a few moments looking around, as if discussing which way to go, then hurry past only centimetres from our shoes. We turn and follow as some continue on while others diverge and disappear into the bushes. The chicks haven't eaten since yesterday and many venture out of the safety of the burrows looking for their dinner. They are covered in a downy fur and won't go to sea until they are old enough to hunt on their own. There is quite a racket going on with chicks and parents all calling to each other - apparently the adults recognize their offspring by its cries. The chicks on the other hand, are completely non-discriminatory and will harass any adult they can find for food. We follow several groups of penguins, sometimes lining up to let them walk past us and sometimes stopping to watch and photograph them. We spend quite a while observing one particular pair hoping to witness the adult feeding its chick. Unfortunately mum (or dad) doesn't co-operate and eventually we move on. There is no shortage of action though - the sand dunes are seething with little bundles of cuteness in dark blue and white tuxedos all intent on reaching home after a hard day at sea. Then after 45 minutes or so it is all over. There are a few stragglers still waddling the path but most of the birds have disappeared into the bushes. You can see the baby in its burrow waiting for mum and dad. This burrow was constructed by local school children. There were quite a few of these at Low Head and the penguins seemed happy to use them. Little penguins are on average 30 cms (12 inches) tall and weigh about 1 kg (2 lbs). They are the smallest of all penguin species. Little penguin colonies are found only in southern Australia and New Zealand. Little penguins are also known as 'little blue penguins' or 'fairy penguins'. They are the only species of penguin which is dark blue and white rather than black and white. The black (or dark blue) and white colour of penguins is camouflage. When they are at sea their white bellies camouflage them against the sky from predators below while their dark backs do the same against the sea from predators above them. Little penguins spend most of their lives at sea, always returning to the same colony they were born in to breed and moult. A group of penguins at sea is called a 'raft'. On land it is called a 'waddle'. 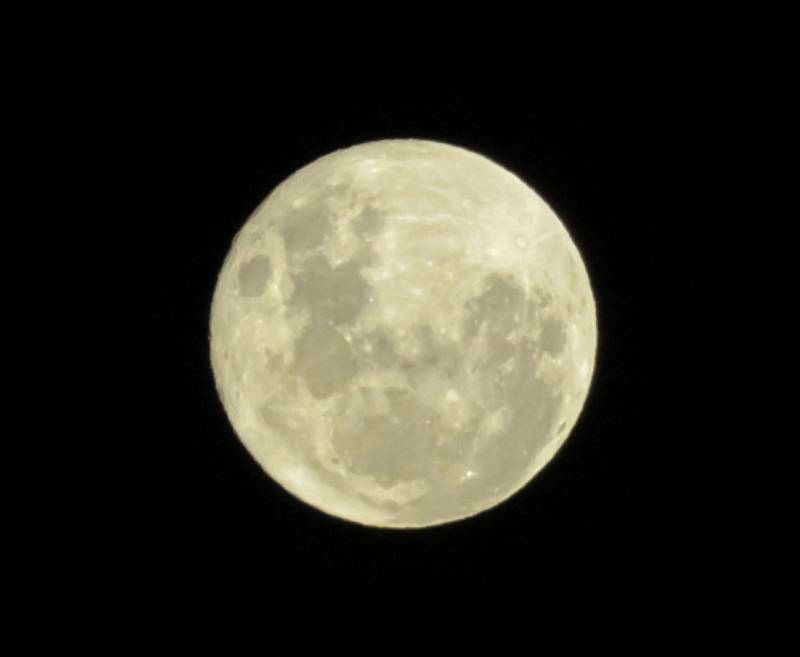 I thought I would sneak in a photo of the super moon just because I'm pretty pleased with the way it came out. Dress in warm clothes and bring a jacket. Low Head is exposed to the wind whipping in from Bass Strait and can get cold, even in summer. Don't bother bringing a torch (flashlight). You won't be allowed to use it, however the guides have torches and do a reasonably good job of lighting up the penguins so you can see them. Set your camera for night shots without a flash. Flash photography upsets the penguins and is not allowed. Although the Low Head penguin tours run year round, penguins come ashore in greater numbers during breeding season between November and February. Drive very carefully when you leave the tour. Some of the penguins cross the road each night to reach their burrows. The beach at Low Head during the day. Phillip Island, Victoria has the most widely known colony of little penguins in Australia. 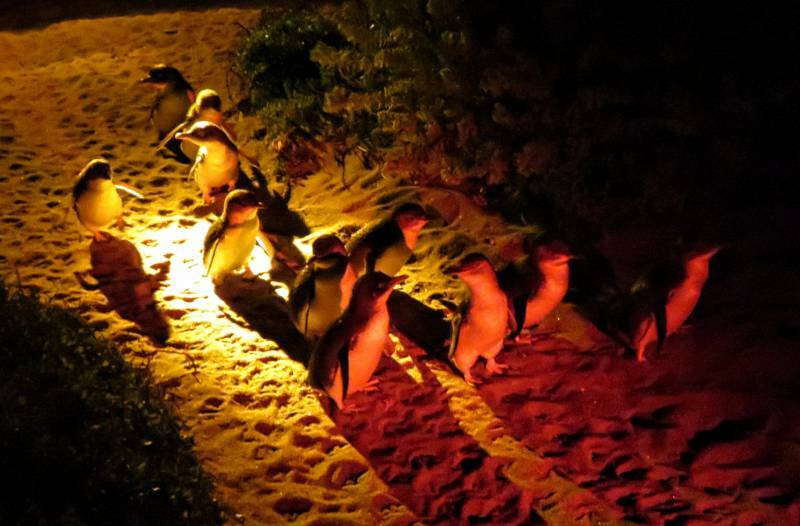 The penguins come ashore each night to crowds of visitors. 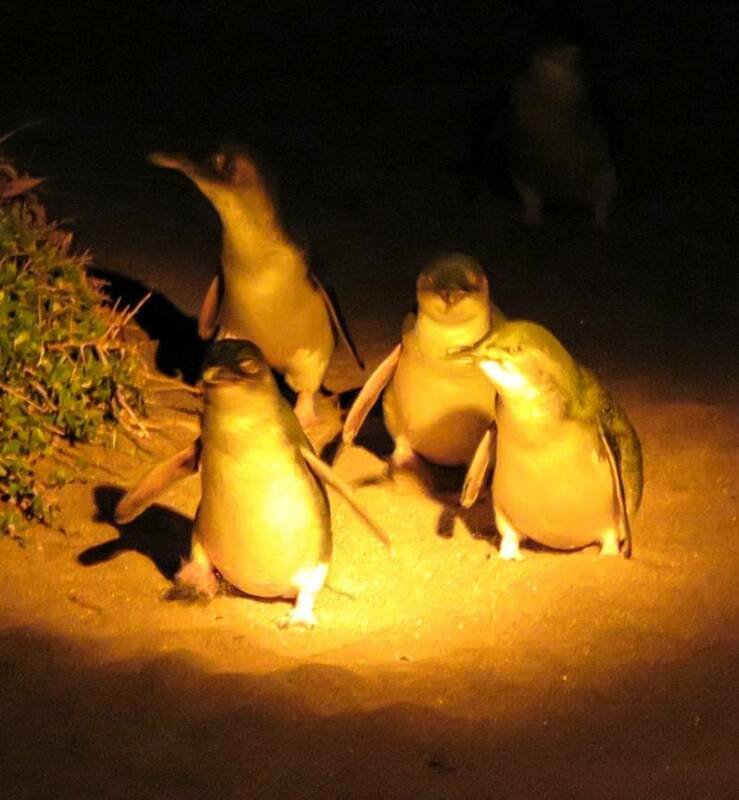 Despite being a big commercial operation it is a great place to see little penguins. King Island is half way between Victoria and Tasmania and a stunning place to visit if you want to get away from the more well-known tourist trails. The far side of the island at Grassy Harbour has the best penguin viewing I have ever seen. When David and I went there about ten years ago it was just us and hundreds of penguins. King Island is remote, the only way to get there is by air, so I doubt things have changed much in the intervening years. Bruny Island is an easy day trip from Hobart in Tasmania. Car ferries leave every half hour in summer from Kettering, about half an hour south of Hobart. The ferry takes about 15 minutes. There is a penguin viewing area at a place called The Neck - you can't miss it. However since the penguins arrive after the last ferry back to the mainland you have to stay overnight to see them. You can read about Bruny Island on my blog post - The White Wallabies of Bruny Island. Other penguin viewing areas in Tasmania include - Bicheno, Burnie, Stanley, Penguin (of course) and Lillico. Penguin Island, Western Australia is 45 minutes south of Perth and a 5 minute ferry ride. 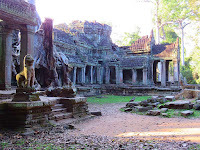 I haven't been there yet but a fellow blogger has recommended it to me. Sydney and Melbourne both have small penguin colonies. The location of the colony at Manly in Sydney was once a well-guarded secret in order to try to protect the very small number of penguins which breed there. Although word has got out it is still hard to get to the colony unless you are a kayaker or own a boat. Melbourne on the other hand has a very accessible small colony which breeds in the rocks at the St Kilda Pier Breakwater. Kangaroo Island is a great destination, but not for penguin viewing. I mention it here because there is a lot of out of date advice on the Internet recommending penguin tours there. I am not sure if you can still do penguin tours on the island but even if you can the colony has been decimated in recent years by fur seals. Read my blog post on Kangaroo Island. Have you seen little penguins in Australia or New Zealand? What was it like and where was it? Note: David and I paid the full cost of the Penguin Tour ourselves. Neither the tour organiser nor our guide was aware that I write a travel blog. If you would like to follow our travels enter your email address in the 'Never miss a post: Follow by email' box in the right hand sidebar just below my profile picture. You got some fantastic shots of the penguins, they're gorgeous! Meanwhile, I once staked out The Neck on Bruny Island to catch a glimpse of the penguins but I guess it wasn't to be. It was a bit disappointing but it was kind of cool to be on the lookout for them. Next time! Did you read my post two weeks ago on the White Wallabies of Bruny Island? We went there a few weeks ago and loved it but we didn't stay on the island so we weren't there at the time the penguins come in. It's disappointing to hear that you didn't see any penguins. Judging by the number of burrows we saw I thought it would be a great place to see them. Perhaps you were there at the wrong time of year. I do know that a lot more penguins appear during summer when they have chicks to feed. Haha - you hit the nail on the head. Along with these few good photos I got a whole lot of terrible ones. I saw your African penguins earlier this year (2016) and I'm going back in a few months to see them again. South Africa, especially the Cape, is one of the great undiscovered destinations of the world. Patience isn't my strong suit but you're right, sometimes it is worth it. What a wonderful experience and great photos! That super moon photo is amazing! I watched the movie 'Oddball' last year and have wanted to see the fairy penguins since then. Wishing you a great travel year in 2017! I have never seen 'Oddball'. I will have to see if I can get a copy and watch it. Happy New Year. Me too. 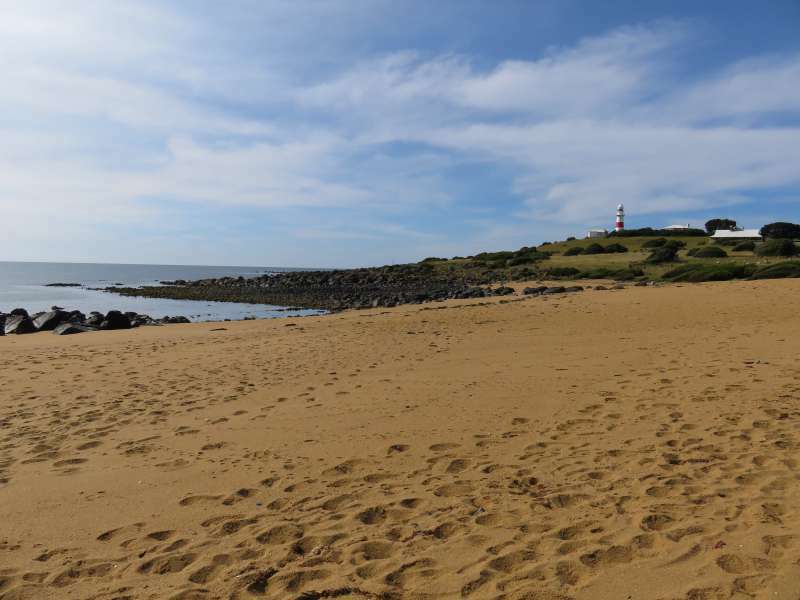 I visited Phillip Island as a child before it became so popular. It looks like you found a nice size colony of the little blue penguins. We have them locally and often see them in the water. 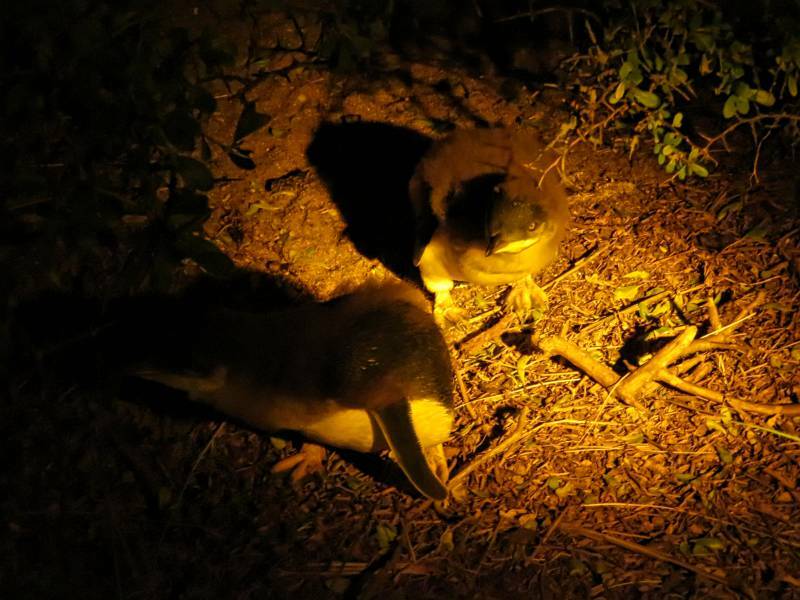 The local park turned bird sanctuary presented an interesting night picture of two bright eyes staring out from a nest - the eyes of a baby penguin. Wow! To have them close to where you live would be fantastic. Apparently the shelters have been so successful that they have been copied by a wildlife protection group. These little guys melt my heart. They are so cute. Nice to read that people can't wander around unsupervised when they come to shore. Your moon shot is gorgeous, too! Little penguins are very timid so for once I agree that doing a tour to see them is the best way to go. Even though I (normally) live in Australia I have yet to see any Fairy Penguins. But we have watched thousands of larger penguins in South America where, in most places (like the coast of Argentina), you can walk freely among them... What always amazes me is the secure way penguins can find their burrow among hundreds on the same barren beach. I am a great fan of penguins. They are just adorable. I have never seen them in South America though. Next time we go I will seek you out for advice on where best to see them. That is so exciting. I would love to see a penguin in the wild. (Yes, I am one of those people who left Kangaroo Island disappointed.) I liked your photos of the baby penguins. I imagine it must have been hard to get good photos of moving animals in the dark. It was unbelievably difficult to get good photos in the dark. I managed a halfway decent video which I put up on Facebook. I also got loads and loads of really terrible photos - lol! The Kangaroo Island thing annoys me a bit. As I understand it there haven't been many penguins there for years and yet tourists are still being lead to believe you can see them there. I don't think it does KI's reputation as a great tourist destination any good at all - and it is so unnecessary because KI has so many other fabulous things to see including great wildlife. Hello Lynn, I was at Georgetown, TASMANIA the other day, I just made 3 albums of the rivers of NW Tasmania, On the ground in NW Tasmania and the high country in nw Tasmania. Sorry to hear you had a bad time at Cape Canaveral Florida, I went for the Skylab and Space Shuttle first launches, the tour guides were a bit uninformed. Hi Stuart, Tasmania is wonderful isn't it. David and I are planning a return visit next year. Watching a launch at Cape Canaveral must have been a great experience.